This article covers 4 free websites to practice mock interview online. These websites provide you a platform to practice interviews in preparation for the actual interview. Each of these websites offers various types of mock interviews from programming to system design, database, and more. You can book an interview of your choice and the team will revert back to you with the interview date and timing. On that day, you can have a live interview with an actual person with expertise in the respective area who also provides you feedback along with your interview scorecard. 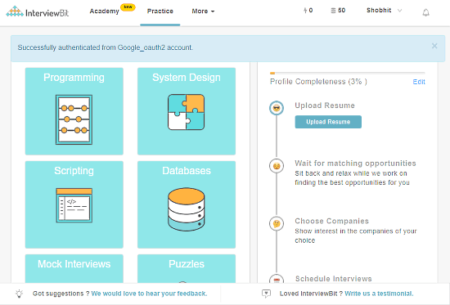 By practice interview online, you can prepare yourself for the actual interview and gain experience. The interviewer’s feedback and scorecard give you an insight into your knowledge base and skill set. This way, you can evaluate yourself and work on your skills accordingly for further improvements. 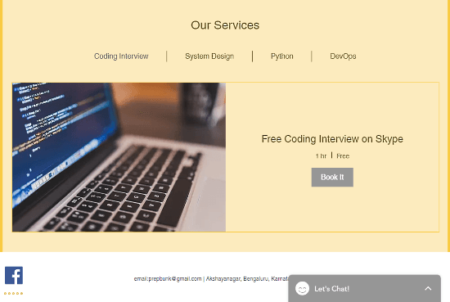 The first website to practice interview online on this list is Pramp. This website offers 6 different types of mock interviews that you can practice. When you select an interview practice, it asks you some essential information like the city you are based in along with your education level and current interview skills. After that, it asks you to choose the role you are looking for the interview. Depending on your choice, it fixes a one-to-one interview with someone with expertise over a video call. This website also features some demo interviews which you can try for practice before the mock interview. Practice mock interview online here. The next online mock interview website on this list is PrepBunk. Unlike Pramp, this website takes you directly to the interview part upon login without asking any information. You can simply select the role you want to interview for and book it. Once you book an interview, this website sends you an email about the confirmation followed by another mail about the interview timing. The interviewers on this website are actual engineers/experts in the respective area. You can have one-to-one around 1-hour long interview with the expert and get their feedback. Practice interview online with PrepBunk here. 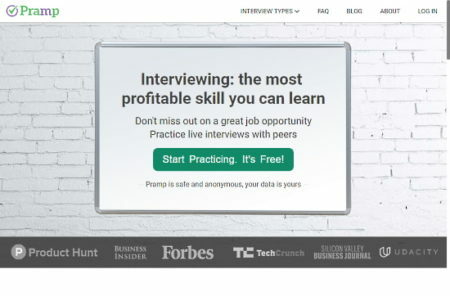 InterviewBit is another website where you can practice mock interviews online. As compared to other websites on this list, here you have to go through a few more steps to book the interview. You have to upload your CV and select the companies you are preparing for. All this information helps the interview to conduct a better interview as per your skills and needs. This website features questions from various popular tech companies which you can practice here. Give this online mock interview practice a try here. 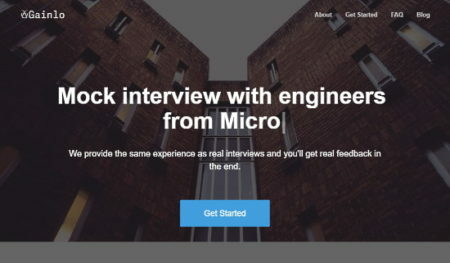 Gainlo is another mock interview website where you can practice interview for various popular tech companies including Google, Microsoft, Amazon, Adobe, Facebook, and more. The process of booking an interview is a one-step process here. All you have to do is fill up your email address and name and this website will reach you back with further steps along with an interview timing. Like all the other websites on this list, on Gainlo, you are interviewed by an engineer who works or worked for top tech company(ies). You can try this online mock interview practice website here. These are the 4 websites where you can practice mock interview online for free and get feedback from people with expertise in the area. This can help know your downside and help you prepare yourself for the actual interview. This way, you can not only improve your knowledge and skills but also gain interview experience which would be very helpful.